What is a Traditional British Flapjack? British Flapjack is one of the most popular tray bakes ever probably because it is so easy to make from oats, Golden Syrup, butter, and sugar. 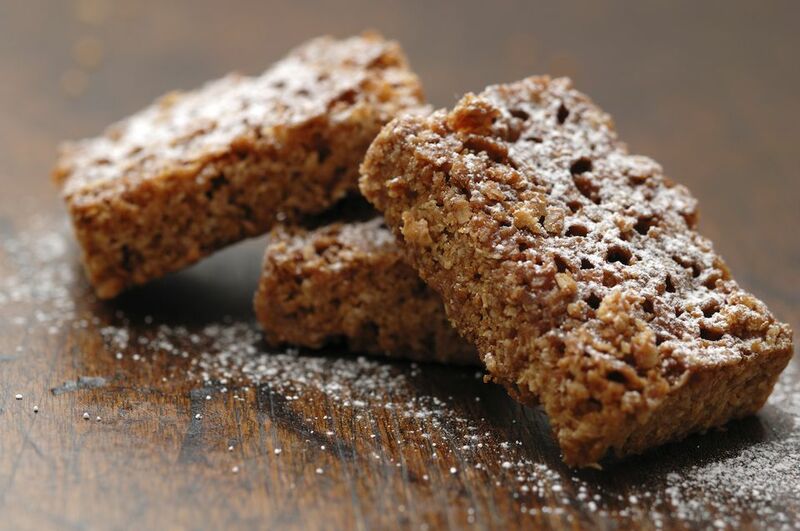 The flapjack is served as a sweet treat with tea or coffee, can be part of a lunch box, or simply a delicious snack. What a flapjack will depend on where you come from and how it is eaten. Here are some examples. Firstly, it is not a pancake. Flapjack is known in the US as a thick pancake, so quite, quite different. Cereal, Breakfast, or Granola Bars are commercially made bars using various grains, fruits, and sugar. The bars are usually eaten to supplement, or even replace breakfast for people on the go. Though purported to 'healthy' there is controversy surrounding the health benefits given the high sugar content of many, not all, of them. Read the label carefully if in doubt. Flapjack does have some healthy attributes which make it good to eat, but it does have sugar in the form of Golden Syrup, a thick, golden sweet syrup used in British cooking since the mid-1800's. Where Flapjack redeems itself is with the oats, which are full of iron, zinc and vitamin B, so you can eat them without too much guilt. As with all cakes, biscuits, bun and the rest is they are treats and of course eaten in excess will never be deemed healthy. That said the Brits love them very much. Are Flapjacks Easy to Make? A traditional Flapjack is one of the quickest, easiest and importantly cheap baked goods to make. With only three ingredients, oats, butter, and Golden Syrup plus a pinch of salt, how could they be difficult? The flapjacks take only five minutes of preparation and about twenty minutes in a hot oven, so are very quick too. Are There Many Variations on the Traditional Flapjack? The number of variations on the traditional recipe are endless and are only limited by your imagination. The three ingredients above form the base of the flapjack and then what you add from them on, is up to you. The favorites to add in are nuts, seeds, dried fruits, coconut, or dried apricots, but you don't have to stop there.